Publisher’s summary: She could save the world—or destroy it. My take: I’m obsessed with Poison Princess. Really…no lie! I’m totally and completely obsessed. Who would have thought that someone would take the 22 trump cards from The Major Arcana Tarot deck, create characters from them, and then write a totally awesome book? There are so many things that make this book fan-friggin-tastic, and I’ll do my best to tell you why without revealing spoilers. The whole story was very well done. It starts out in the point of view of this obviously psychotic and creepy dude who has just lured a girl into his home, and that had me terrified of what might happen next. But you don’t get to find out what happens next until quite a bit later because the next scene is in the point of view of the popular girl at school, Evie, who is returning after the normal school summer break. Except Evie’s summer break (little do her friends know) was anything but normal…she spent her summer in a mental institution and has no doubt in her mind that she’s truly insane. But is she really? It’s when the apocalypse happens that she realizes that she might not be so crazy after all. One of the things that makes this book so phenomenal is the characters. And, even though I can’t say which character I like best because I have so many favorites, each one made me want to learn more about the characters of the tarot. So it’s pretty cool that The Arcana Chronicles website shows all the trump cards and the story character associated with each card. If you want to head on over to The Arcana Chronicles website, go to Fun Stuff and just click on a trump card to flip it over to see if Kresley Cole’s introduced that card in her series. Oh, one last thing! I do want to especially mention one character…Jack Deveaux! Boy is he drool-worthy but, at the same time, what a complete jerk! 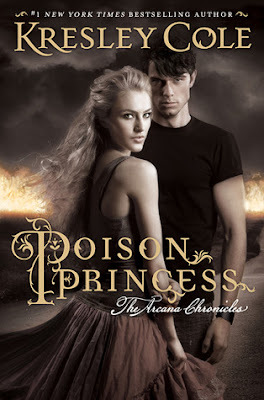 There’s action, heartbreak, and romance in Poison Princess…and more than enough complications throughout the last half of the book to make the story move really fast. And then the end is so unbelievably well done! It ties everything up but, at the same time, it leaves you suspended with a phenomenal cliffhanger. It was awesome! This is a must read…like right now. Or, listen to the audio if you like because that’s what I did. This sounds really awesome!! I have to check out the website. I am totally intrigued by the sounds of the cards!! I have wanted to read this one. Maybe I will pick up the audiobook!! I thought the Tarot Card idea was so creative! And, "Jack Deveaux! Boy is he drool-worthy but, at the same time, what a complete jerk!" Couldn't agree more, but I think a lot of the trouble was due to poor communication between Evie and Jack that kept them from really working things out.